Austin Air Purifiers - a Choice of the Department of Homeland Security, FEMA. Austin Air Purifiers Employ High Efficiency 5-Stage Air Filtration System. Austin Air Purifiers Available in Wide Range of Models for Most Air Cleaning Requirements. Austin Air Purifiers Employ Durable and Non Off-Gassing the All Metal Housing. Austin Air Purifiers Come with 5-Year Manufacturer's Warranty - on the Strongest in the Industry. Austin Air Purifiers Available in Wide Range of Colors to Match Your Decor. Austin Air Purifiers have been chosen by the Department of Homeland Security, FEMA as the effective way of protecting American citizens from the contaminant vapors. Test Report to the US Army Soldier, Biological Chemical Command. The purpose of this test was to determine the effectiveness of commercially available air cleaners at removing contaminant vapor (simulant) from a sealed room. Over 100 units were studied. The reduction in the amount of vapor contamination after the use of the air cleaner was measured. The Austin Air HM400 reduced the vapor concentration by 90% in less than 35 minutes. The Austin Air Purifier HM400 was amongst the most effective of the commercial filter units in reducing the simulant vapor dosage within the test room. Military carbon cloth (the same kind used in bio/chem suits) and activated carbon combine to adsorb hundreds of harmful gases and vapors. This filter design is unique to the Guardian 1 and provides unparalleled protection. The addition of the Guardian 1 to Shelter in Place kits provided to residents of Calhoun County ensured that these kits far surpassed protections recommended by government agencies to create a Shelter in Place. When a building or room is tightly sealed, contaminated outside air can still enter. The Austin Air Guardian 1 will reduce and eliminate the hazard of these vapors. Austin Air Purifiers employ High Efficiency 5-Stage Air Filtration system to ensure the best air purification performance in combined dust, smoke, odors and most gaseous chemicals removal. PermaFilt pre filter traps large dust and dirt particles. 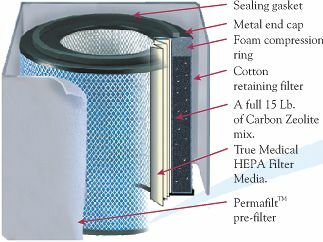 PermaFilt pre filter protects fine True HEPA filter from contamination and extends HEPA filter's lifetime. Pre filter can be easily cleaned using the vacuum cleaner right through the grill. True HEPA filter traps over 99.97% of Lung Damaging Dust, Allergens, Dust Mite Debris, Pollen, Pet Dander, Mold and Plant Spores, Asbestos Dust, Bird Feather Dust, most of the Microbes, Bacteria, Viruses down to 0.3 micron in size. Large Granular Activated Carbon and Zeolite Filter Canister. Granular Carbon and Zeolite adsorbent is highly effective in removal from the air of Cigarette Smoke, Stale Tobacco Odors, Pet Odors, Cuisine Odors, Cleansers and over 4000 other Chemicals. The intermediate filters completely cover the Activated Carbon Canister and ensure that any dust that may be released by granular carbon is contained inside the filters and does not enter the filtered air coming out of the unit. 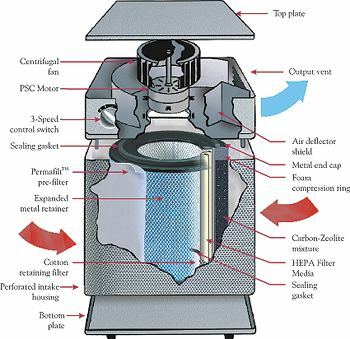 To make the filter replacing procedure simple, True HEPA Filter and Activated carbon canister are combined all together in the filter assembly. This also ensure that, each time you replace the filters you restore the initial efficiency and performance of your Austin Air Purifier for 100 percent. Top and bottom Vacuum Seal Rubber Gaskets eliminate the possibility for polluted air to bypass the air filtration system. Austin Air Purifiers are available in Wide Range of Models to meet most air cleaning requirements and air purifier needs. Austin Air HealthMate Standard and HealthMate Junior are the Excellent choice for complete removal from the air of your home and office of all allergens, airborne contaminates, over 4000 chemicals and all noxious odors. Austin Air HealthMate HEGA (or Allergy Machine) combine the gas trapping ability of a lightweight military Cloth-Embed carbon with HEPA's particle filtration to deliver the perfectly clean air in homes and offices. Austin Air HealthMate Plus (Superblend) employ large amount of Carbon-Zeolite mix with Potassium Iodide to provide effective removal of specific chemicals such as, Volatile Organic Compounds (VOCs), formaldehyde, ammonia, etc. Austin Air HealthMate Plus (Superblend) is the air purifier model of choice for areas with new carpeting, new furniture, lots of office machines, newly constructed houses, as well as for use by people with hyper or multiple chemical sensitivity. 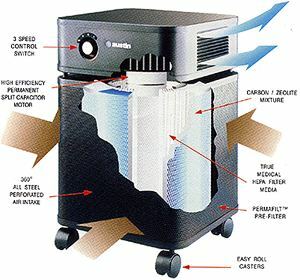 Austin Air Purifiers Employ the All Metal Durable and Non Off-Gassing Housing. Austin Air Purifiers combine the attractive well balanced design with the advantage of a super durable all metal housing. The 360-Degree all steel perforated air intake ensures the best air cleaning performance. The baked-on powder coat finish is non gloss, slightly textured surface. It resists scratching, scuffing and smudging. It can be cleaned easily with just a wipe of a cloth and will retain the original attractive appearance for many years. The all metal housing and baked-on powder coating do not produce any toxic off-gassing. The unit itself also does not produce any ozone or negative ions, and is absolutely safe for use by people with Multi- or Hyper Chemical Sensitivity. Austin Air Purifiers Come with 5-Year Manufacturer's Warranty - on of the Strongest in the Industry. Austin Air Purifiers come with 5-Year Manufacturer's Limited Warranty - one of the strongest, and by far, the most Comprehensive in the Air Purifier Industry. In the unlikely event that you're not completely satisfied with your new Austin Air Purifier, we provide a 30-day, no-questions-asked, money-back guarantee. Austin Air Purifiers are warranted to be free from defects in material and workmanship under normal residential use for five years from the date of purchase. 5-Year Pro-Rated Warranty on Filter Assembly. True HEPA and Activated Carbon Filters are warranted to last for up to 5 years under Normal use and in Normal Residential conditions. If True HEPA or Carbon filters require replacement within the warranty period, the owner of the Austin air purifier becomes eligible for receiving a new filter assembly at a Partial Cost. Austin Air Purifier Available in Wide Range of Colors to Match Your Decor. All Colors are non-gloss textured colors that blend perfectly into decor of any home or office. The standard colors are: White, Black and Sandstone. Silver is a new optional color available at extra cost.